Let's talk metallics. Sure they're easy to wear as jewelry but what about in your wardrobe? There is a way to wear metallic without it being rock-chick. Take a look. I love this skirt. The wide waist band matches the hem line and the specks of metallic make it dressy. With black tights? You will be the best dressed girl where ever you go. I really like how classy this blouse is with the beautiful neck line. I. Love. These. Shoes. Boat shoe glitz? Perfect. Metallics can be done in a non-rocker way when broken up into pieces. 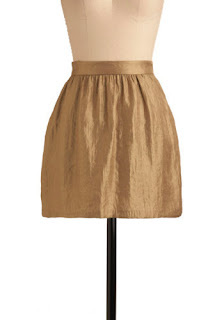 Try a tweed skirt with a metallic twill or a blouse with gold embellishment. It's the perfect way to add some glitz to to your outfit.